Teens need examples of healthy relationships in their lives, and what better example than one they are in? In our Volunteer Youth Mentoring Programs, that’s exactly what we strive to achieve. The adolescents and young adults in the program are all court referred, which doesn’t mean they were arrested necessarily, only that they got in trouble somehow. Maybe they got in a fight or got in trouble at school. Some children have had multiple probation officers and therapists, so when they are referred to our Mentoring program, they’re excited that it’s neither required, nor another probation officer—it’s not another system for them to jump through the hoops of. Mentees are matched one-on-one with mentors, who come from all walks of life. Some of our mentors are just out of college, while others are retired attorneys. Mentors meet with their mentees and engage in fun, educational, and cultural pro-social activities, like going to Cirque du Soleil or a Chris Rock concert. One mentee was matched with a mentor, but she was consistently lying to her mentor and was not improving. Realizing the mentor was not a good fit for her, we decided to give her a new mentor, and her behavior transformed massively. She didn’t lie to her mentor, had no new arrests, got a job, and soon even voluntarily went back to therapy. 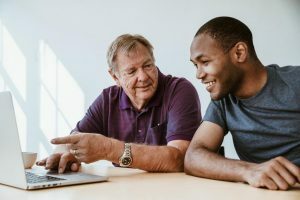 Although our mentors are only asked to participate in the program for a year, their relationship with their mentee often doesn’t end after either has left the program. These are real, lasting relationships being built that are a joy for both the mentors and the mentees throughout their lives.